New Age Metals Engages P&E Mining Consultants Inc to Complete Preliminary Economic Assessment (PEA) Study on its 100% Owned River Valley Platinum Group Metals (PGM) Project, Sudbury Ontario – New Age Metals Inc.
NAM’s Platinum Group Metals (PGM) Division, more specifically our River Valley PGM Project in Sudbury, Ontario, is the largest undeveloped primary platinum group metal project in North America. Management has director approval to advance the project towards its first economic study, a Preliminary Economic Assessment (PEA). NAM has engaged P&E Mining Consultants Inc of Toronto Ontario to lead the PEA study on the River Valley PGM Project. The objectives of the PEA are to create a mine plan, mine schedule, a capital cost estimate, and an operating cost estimate incorporated into a financial model to provide total cash flow, after-tax net present value (NPV), and after tax internal rate of return (IRR). NAM plans to initiate a 4th phase diamond drilling program (see page 2 for further details) on the newly discovered high-grade Pine Zone to contribute to early PEA work, performed by P&E Mining Consultants Inc and a second international mining consultant group selected to assist on this study. The completion of the PEA is scheduled to be completed on or before the end of the first half of 2019; Geotechnical, metallurgical, mineralogical, and cost estimation work is ongoing, all of which will assist in the completion of the PEA. Our proposed Corporate Mandate is to build a series of open pits (bulk mining) over the 16 kilometres of mineralization. Initially, we wil focus on the northern portion of the project and our proposed plan is to mine, crush, and concentrate on site, then ship the concentrates to Sudbury. The objective of NAM before the May 2018 NI 43-101 updated Mineral Resource Estimate was to increase the Mineral Resource in the northern portion of the project which has traditionally been higher grade (Dana North/Dana South/Lismer North) to over 1Moz of PGMs. The discovery of the new higher-grade Pine Zone has added considerably to this area. The new NI 43-101 accomplished this goal. P&E Mining Consultants Inc, was established in 2004 and provides geological and mine engineering consulting reports, Mineral Resource Estimate technical reports, Preliminary Economic Assessments and Pre-Feasibility Studies. P&E are affiliated with major Toronto based consulting firms for the purposes of joint venturing on Feasibility Studies. Their experience covers over 300 technical reports, including but not limited to Platinum Group Metals (Platinum, Palladium, Gold, Rhodium) and Base Metals projects including Copper, Nickel, and Cobalt. P&E has extensive Canadian and International experience in geological interpretation, 3D geologic modeling, NI 43-101 Technical Report writing, Mineral Resource and Mineral Reserve Estimates, property evaluations, mine design, production scheduling, operating and capital cost estimates and metallurgical engineering. P&E Mining Consultants Inc operates under Certificates of Authorization from the provinces of Ontario, Newfoundland and Saskatchewan. Associates are also licenced in the provinces of British Columbia, Quebec, NWT/Nunavut and New Brunswick. NAM plans to initiate a diamond drilling program on the newly discovered high-grade Pine Zone to contribute to early PEA work that will be performed by P&E. P&E will use all previous NI 43-101 compliant Mineral Resource data, the 2018 Abitibi Geophysical report, the reinterpretation of Abitibi Geophysical reports by Alan King, P.Geo our Sudbury Geophysical consultant as well as the 2018 Summer/Fall drilling Results to determine a target mine size for the potential starter open pits in the northern 16 kilometres of mineralization. From this target size, P&E will be able to generate early and advanced mine production scenarios including a mine production schedule. The PEA is scheduled to be completed on or before the end of the first half of 2019. Figure 1: Induced Polarization (IP) chargeability results which show potential drill targets from the 2018 Alan King Geophysical report on the northern portion of the project. Figure 2: Zone map of the River Valley PGM Deposit: The Yellow Band in Figure 2 represents the footwall potential area of the River Valley Deposit. Over time NAM’s technical team would like to complete an extensive geophysical program from the top of the 16 km in the most northern zones to its most southernly areas that now are known as the River Valley Extension. The objective of a 16 km program would be to outline other Pine Zone type deposits. The 2018 Abitibi geophysical program and Alan King’s reinterpretation of that report have defined several new targets in the northern portion of the project. See Figure 1, page 3 of this release for more related information. NAM’s flagship project is its 100% owned River Valley PGM Project (NAM Website – River Valley Project ) in the Sudbury Mining District of Northern Ontario (100 km east of Sudbury, Ontario). 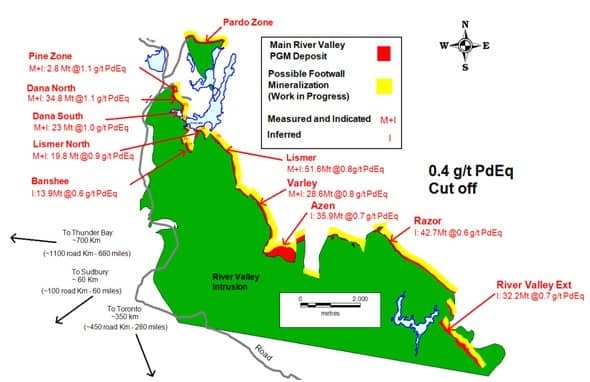 Presently the River Valley Project is North America’s largest undeveloped primary PGM deposit with Measured + Indicated Mineral Resources of 160 million tonnes @ 0.44 g/t Palladium, 0.17 g/t Platinum, 0.03 g/t Gold, with a PdEq metal grade of 0.90 g/t at a cut-off grade of 0.4 g/t PdEq equating to 3,297,000 ounces PGM plus Gold and 4,626,000 PdEq Ounces (Table 1). This equates to 4,626,250 PdEq ounces M+I and 2,714,000 PdEq ounces in Inferred (see May 8th, 2018 press release). NAM is currently conducting Phase 4 of their proposed 2018 exploration and development program. The current program is based on recommendations of previous geophysical studies and reviews by the company’s consultants, recent drilling, ongoing advanced metallurgical and minerology studies and selective pit design drill programs. The results of Phase 4 will assist in early PEA work being conducted by P&E Mining Consultants Inc and is meant to contribute towards the River Valley PEA. Mr. Michael Neumann, P.Eng., a veteran mining engineer and one of NAM’s directors, will oversee the completion of the PEA.